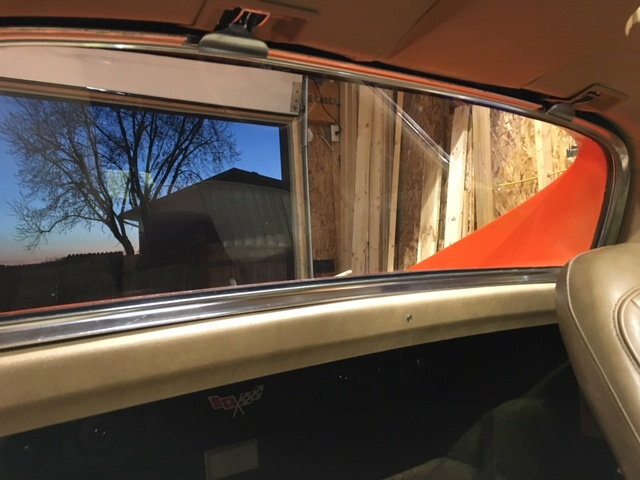 Just finished Rem rear window, 8 track & Soundbar in the '76! It's been a journey but here are some pics. Thanks for all who provided info! Rear window was a little trying but I got it done. The worst part is the seal installation. Good job on the 8 track installation, it looks factory! The window looks good too!!! can you post a full length pic of the sound bar? Im might do the same and was wondering about the length and the corners. Hows the sound quality? Nice job Ole442 ,Looking good . I'll try to snap a wider photo shortly. Sound is good for my 1970's era 8 track. If you're into todays high end/dollar sound, you won't be impressed. It's adequate for my application. I've never seen a removable rear window. Is this a kit or a factory rebuild? Looks great! I am shocked that anyone still has and uses 8-track cassettes though :-p. Very cool fab skills and brilliant location. Another reason why I am just not cut out to do a NCRS rebuild: I need modern acoustic equipment in my cars. 8 track looks great. Actually thought it was factory. The early C3's had them (1968 thru 1972). I just bought the pieces and installed them in my 1976. It was not as easy as I thought but not too bad. It might have gone better when I was 28 but I got it done. The window seal installation was the worse part! You pop the two latches at the top and the window pivots forward and out of the car. My cousin had one in his big block '69 Vette back in the day and I really liked that. Thanks! Yes, I'm OLD SCHOOL! I'm restoring a 1972 Olds Cutlass 442 and when I'm done it will also have a Craig Power Play 8 track unit with a vintage slide in mount! Been collecting tapes for years and, so far, all play well! Here is as full length as I can get. I tried to put it in the back and tighten the set screws but it was all out of wack. So, I measured the width I wanted and squared it up on the workbench and then tightened down the set screws real tight. I put like 8 large strips of the one side of Velcro across the back and taped clear plastic (visqueen?) to the front and flipped it over the back to get the Soundbar in position so it wasn't stuck to the carpet yet. Once in position with it lightly pushed back against the carpeted bulkhead, I pulled the clear plastic sheets out and pushed/stuck it against the carpeted bulkhead. The fact that it is against the bukhead but down low behind the wheelwell housing keeps it pretty well in place. I do plan on putting approx. 4 self tapping screws into the bulkhead to further steady it. Just trying to get up the nerve to drill there! I ran the speaker wires down both sides behind the carpet and hooked it up. Last edited by OLE442; 04-17-2019 at 08:57 PM. Is the soundbar this one from Willcox? From your post it seems that it is "stuck" to the rear bulkhead with some kind of adhesive?!?! I'm considering one for my '75 convertible but I'm not sure it will work out in the convertible. Looking at your placement it seems that the sound bar would be almost totally obscured by the folded soft top. 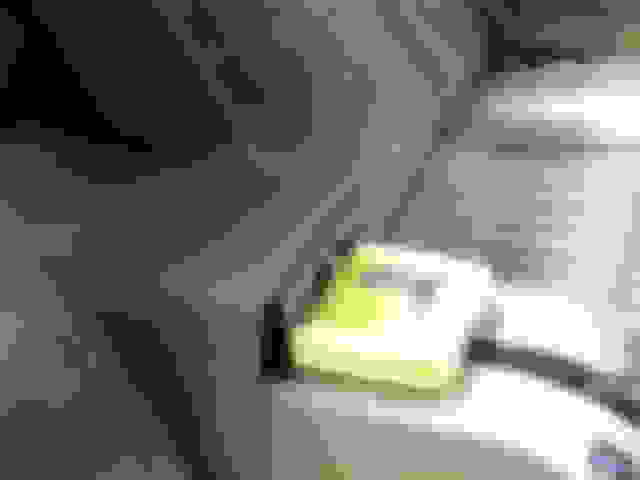 Last edited by 737av8or; 04-17-2019 at 09:13 PM. 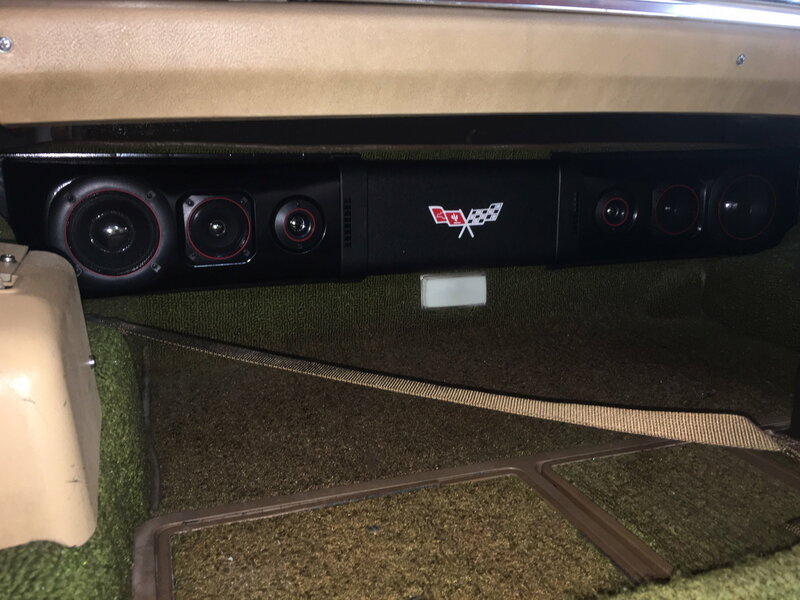 My 73 verge had the same sound bar installed. It was done by a car audio shop, they cut the foam flags insignia so that the rear hatch light could be left intact. Also the Speakers are on two tracks, so you may adjust them to the exact size required. I removed mine as I wanted to have an original Delco Radio. I found the invoice for mine and it was ordered from Eckler's. On the bill it is listed as: "Challenger Speakers, Custom Autosound 1963-19". It is stuck to the carpet on the rear bulkhead because I put a large amount of the non fuzzy half of high strength Velcro on the back of the unit before I set it in there (This did not come with the unit). The unit expands as wide ad you need and some say that will hold it.....I wouldn't bet on that in a crash. So, I added Velcro and will shoot some self tapping screws into the bulkhead to be safe. Last edited by OLE442; 04-20-2019 at 01:18 PM. You might want to ask convertible installation questions of the member "Eliredandblack" in this thread. Also, CF member Frank_Nesta informed me he installed one in his convertible so he might respond with info if you PM'd him. Last edited by OLE442; 04-20-2019 at 01:27 PM. My convertible had a good bit of industrial strength Velcro stuck to the rear vertical carpet. They also had two sheet metal screws for good measure, remember that the gas tank is in the area if you go with the screws. I think there is only one brand of sound bar sold by all the vendors. The top did get in the way, but you could still hear the speakers. You could get the sound bar measurements and make a box to see if you would be happy. I gave mine away so I can’t help with their size. Since you added the removable rear window are you also planning on installing a storage tray for the rear window? And if so, will that fit/work with the soundbar you have chosen? Just curious. 2) I really do not want to drill that many holes to install the backing plates and the hinges in a low mileage car. Right now, I can reverse the removable rear window and go back to stock but multiple visible holes are another story. I just listed the storage tray, brackets, hardware and push button latch on the CF C3 FOR SALE section last night! OLE442, nice work, the removable window is in my near future, I have everything waiting except different halo panels. Did you trim your originals and then use bezels around the latches or replacement panels?